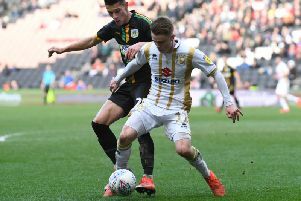 After Dons began to form an unwelcome habit of conceding late, Baily Cargill believes his team-mates have turned a corner. Saturday's 1-0 win over Cambridge United was their third win and clean sheet in succession as Dons have climbed from 13th to fourth in League 2 in a matter of weeks - ironically since conceding in stoppage time against Lincoln City in their only league defeat of the campaign. Chuks Aneke's 29th minute goal was enough to secure the three points, but it was a backs-to-the-wall performance in the second half from Paul Tisdale's side as they kept the home side at bay. Cargill, a regular in the side since arriving from Bournemouth in the summer, said it was a huge relief to get over their problem with late goals. "I think if you'd have been in the dressing room afterwards, you'd have seen how nice it was," he said. "We've over the moon, it has been a bit easier in the last few weeks, but we've had to grind it out and they're the ones you enjoy the most. "It was really nice, we've come a long way. Earlier in the season, Cambridge may have nicked a goal, but the clean sheet, three on the bounce, three wins on the bounce, it couldn't be going much better at the moment. "We've learned a lot of lessons and we stood firm. We defended so well – Jordan and Walshy were brilliant today. It's so important to keep clean sheets because we look like scoring at the moment. Sometimes you need to (throw yourselves in front of the ball) because teams are going to get in and you need that bit of last ditch defending. But we all defended well, even the strikers and midfielders." Dons are now fourth in the table, just a point off the automatic promotion places, but Cargill is confident Dons are more than capable of breaking into the top three sooner rather than later. He added: "We can't get too far ahead of ourselves, but we'll keep plugging away, picking up results and we'll find ourselves in the top three in no time. We're a good team, we know that, but we have to keep our feet on the ground. The results will take care of themselves if we keep playing well. It's a long, long season and we're still in the early stages."